If you are looking for a full line to meet pool or fountain needs, this is it! Using a centuries-old technique from Europe, a design is applied by screen to a pre-glazed body. Wax resist, the oily substance used to form the design, allows for a thick layer of glaze to be applied between the lines by rubber syringe without crossing the lines of the design. Upon firing, a high relief and perfectly symmetrical design remains. White porcelain: No other talavera tile has undergone the laboratory tests that ours have to assure its installation ability in all climates, and for resistance to pool chemicals. The glaze is the thin layer of glossy material on the body of the tile, which confers aesthetic and technical properties such as color, design, impermeability and hardness. Size Averages: (3 3/4 x 3 3/4), (5 3/4 x 5 3/4), (2 x 2). Although Villa and Mission Imports, LLC maintains high standards of quality control, variation in size and color may be present from tile to tile, and shipment to shipment. There is no guarantee that tiles ordered as add-ons will match those from original orders. This is an intrinsic characteristicof all ceramic tiles, and particularly handcrafted tiles. 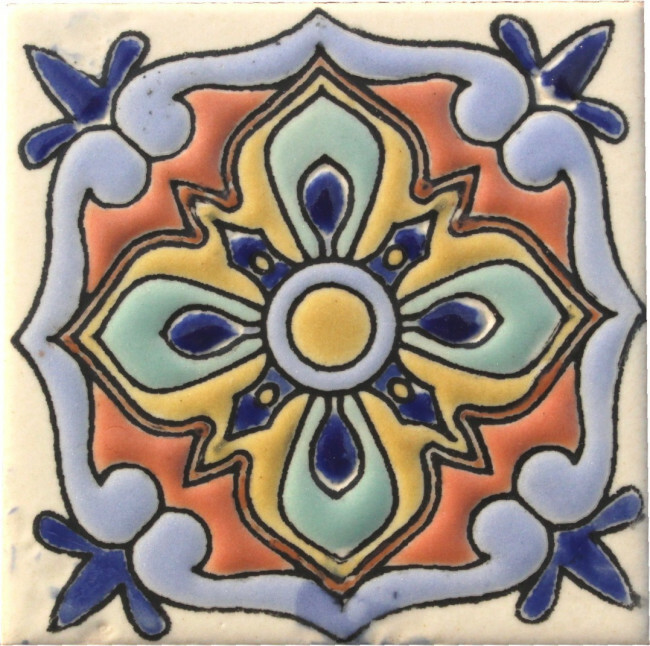 Catalina Tile (also Malibu Tile), comes from the California revival movement of the early 20th Century. The tiles are all-weather porcelain, to allow for outdoor installations anywhere. Catalina tile adorns the serpentine wall that snakes along Crescent Avenue, the Wrigley Memorial, the Botanical Gardens, the old Bird Park aviary, benches, storefronts, fountains and numerous homes and buildings around town.